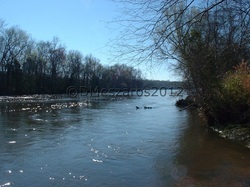 The Wateree River in Kershaw County, South Carolina. Joshua Palmer's first land grant in 1762 was in the distance, on the opposite bank of the river. 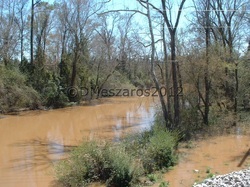 Sanders Creek in Kershaw County, South Carolina. Joshua Palmer was granted land on both sides of this creek in 1767. The Revolutionary War Battle of Camden occurred very near this site on 16 August 1780. 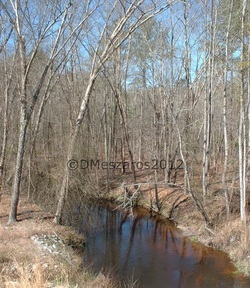 Lynches Creek in Darlington County, South Carolina near the site of Tiller's Ferry. Joshua Palmer was one of the signers of a petition to establish the ferry in 1791. He purchased land in this area, beginning in 1785. 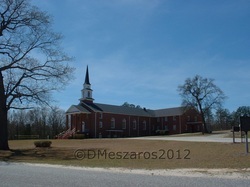 Gum Swamp Church near Hartsville, Darlington County, South Carolina. The church was founded as Lower Fork of Lynches Creek Baptist Church in 1789 "under the care of Joshua Palmer." This building was erected in 1955. Historical marker in front of Gum Swamp Church, Hartsville, South Carolina. 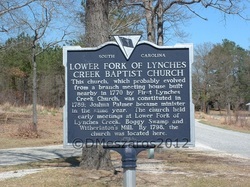 The marker reads:"Lower Fork of Lynches Creek Church. 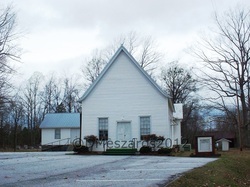 This church, which probably evolved from a branch meeting house built nearby in 1770 by First Lynches Creek Church, was constituted in 1789; Joshua Palmer became minister in the same year. The church held early meetings at Lower Fork of Lynches Creek, Boggy Swamp and Witherinton's Mill. By 1798, the church was located here." In 1794, Joshua and 16 others petitioned the South Carolina Senate to establish a Baptist society on Duncan's Creek in Laurens County, South Carolina "under the cear [sic] of Joshua Palmer." 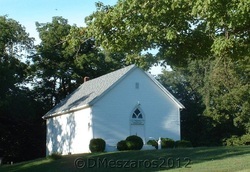 The petition stated, "your Petitioners have it in Contemplation to Build Three Meeting Houses in the Bounds of Their Congregation it Being Very Large & Pray to become incorporated agreeable to the Laws of their Country and Known By the Name of the Upper Baptist Church on Dunkins Creek." 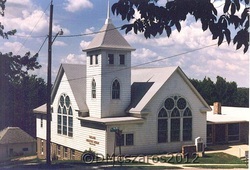 Shown here is Langston Baptist Church, a descendant of Joshua's church. It is located near Clinton, South Carolina. The land was deeded to Upper Duncan's Creek Church by the Langston family. New Hope Cemetery in Harmony Township, Union County, Indiana. The site once had a school and a church, founded in 1807. Rev. Joshua Palmer was reported to be pastor of New Hope Baptist Church in 1812. Perhaps the church located here was a descendant of his church. Indian Creek Baptist Church, Reilly Township, Butler County, Ohio. Rev. Joshua Palmer was an elder in this church in 1810. 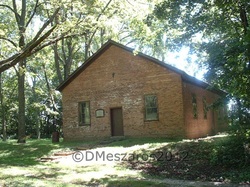 This brick building was erected in 1829, after Joshua's time. Site of the Silver Creek Church, Liberty Township, Union County, Indiana. The land for a house of worship and cemetery was sold to the church trustees by Joshua Palmer, son of Rev. Joshua Palmer, in 1820. Joshua Jr. was the first clerk of the church. Village Creek Primitive Baptist Church, Connersville Township, Fayette County, Indiana. Rev. Joshua Palmer's daughter, Mary, and her husband, William Sparks, were among the founders of the church in 1824. Mary and William and many of their descendants are buried in the church cemetery. 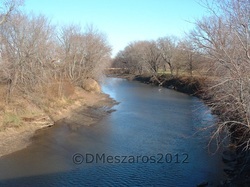 The Spoon River near Knoxville, Illinois. William Palmer, son of Rev. Joshua Palmer, lived near this river from about 1828 to 1836. While residing in this area, William made his living as a farmer and a bee hunter. 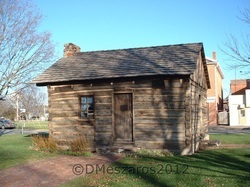 John Sanburn's cabin in Knoxville, Illinois. This cabin was built in 1832 and is probably like the cabin in which William Palmer and his family lived in Maquon Township, Knox County. William and his family were acquainted with John Sunburn, who was a merchant. William Palmer's land in Drury Township, Rock Island County, Illinois, looking toward the Mississippi River in the distance. William deeded the land to two of his sons, William Jr. and Minor, in 1837. 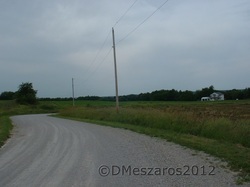 Land owned by William Palmer's son, Benjamin Palmer, in Drury Township, Rock Island County, Illinois. Benjamin lived here until 1852, when he moved to Pottawattamie County, Iowa. 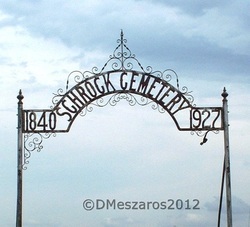 Schrock Cemetery, Taylor Township, Sullivan County, Missouri. Rev. Joshua Palmer's son, Joshua Palmer Jr., died in the late 1840s, probably in Indiana. His widow, Fannie (Stiles) Palmer, and two of his sons, Elihu and Joshua, moved to Missouri soon after his death. They are buried in this cemetery, along with many of their descendants. Oakland Christian Church, Oakland, Pottawattamie County, Iowa. Members of the Palmer family founded this church as the Big Grove Missionary Baptist Church in 1861. Big Grove was the original name of Oakland. The Rust Block in Oakland, Pottawattamie County, Iowa. 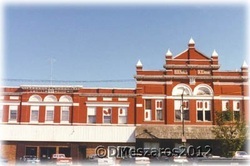 These buildings were erected by Stephen Sumner Rust, a great-grandson of Joshua Palmer, in 1898. 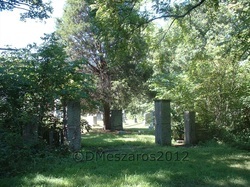 Oaklawn Cemetery in Oakland, Pottawattamie County, Iowa. 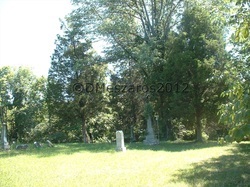 The cemetery is located on land supposedly deeded to the town by Minor T. Palmer, son of William Palmer and grandson of Rev. Joshua Palmer. Many Palmer descendants are buried here. 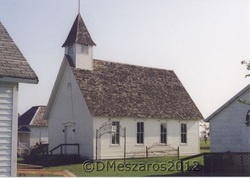 Bethel Church was moved from its site at the abandoned village of Peiro, Iowa to the Woodbury County Fairgrounds in Moville, Iowa. Many Palmer descendants attended this church and some are buried in the cemetery at Peiro.